It’s been another successful year with the team completing stunning projects for numerous high profile commercial buildings and leisure facilities. But that’s not all. Here’s a look back at what else we’ve achieved in 2018 – our seventeenth year of consecutive growth. In the early spring we teamed up with Saneux to open a brand-new showroom based in the heart of Clerkenwell. We created a number of commercial room sets for the displays which were designed to help clients visualise a finished washroom design. The high specification washroom products on display are all from our bespoke Iconica Collection, which continues to be popular, thanks to its extensive range of unique materials, designs and finishes. Our new SmartLOK cubicle locks, which we launched in the summer, are also on display within the new showroom. Ergonomically designed and stylish, smartLOK cubicle locks are operated by just the touch of a button and add a design-led feel to any washroom space. By adding a new product to our glass Concerto duct panelling range in the form of glass panels with unique metal mesh inserts, we can offer our clients an even greater range of design options to take advantage of. We also expanded our Arpeggio vanities range with a new concrete option to provide the perfect solution for those looking to create on-trend industrial-inspired washrooms. Hard-wearing and easy-to-maintain, concrete vanities add to a high specification washroom design. 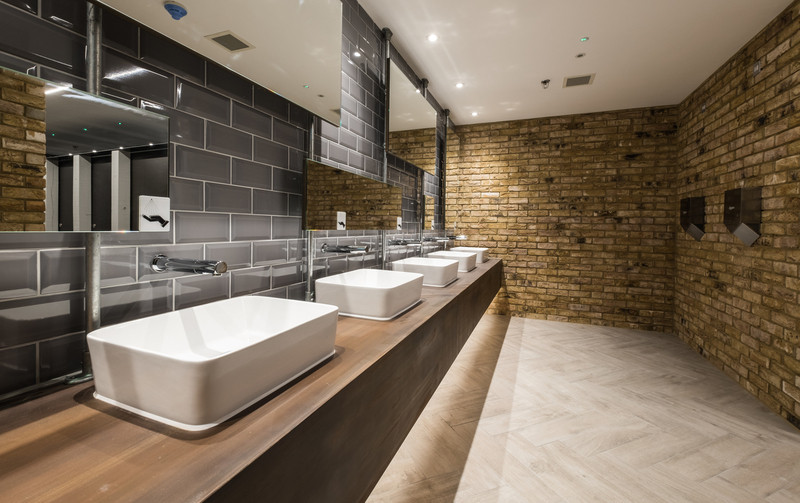 Utilising innovative architectural films to refresh rather than replace existing toilet cubicles, the new Washroom Refresh service allows us to complete a full washroom refurbishment in a fraction of the time. With an extensive collection of more than 1,000 patterned and textured finishes including faithful reproductions of wood, metal, marble, leather and stone, Washroom Refresh offers a virtually limitless array of designs to create an entirely new washroom space. What’s more, the films are durable, stain resistant, easy to clean and repair – extending the life cycle of the existing facilities and adding to the eco-credentials of the project. Don’t forget follow us on LinkedIn, Twitter and Instagram and see what we’ve got in store for this year.